What if you could improve your performance in the areas that seem to be most at odds with each other-work and life beyond work-at the same time? Most of us assume it can't be done. But contrary to the conventional wisdom, the different domains of our lives don't have to compete in a zero-sum game. However, managing them takes real leadership skill. 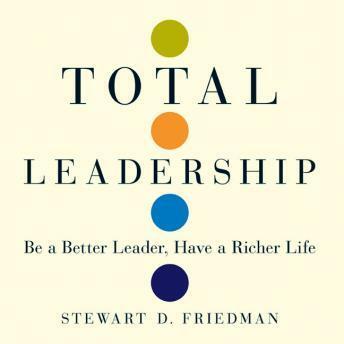 Adapted from author Stew Friedman's popular Wharton School course, Total Leadership will help you identify your core values-what's fundamentally important to you-and make them come alive in your everyday actions at work, at home, in your community, and within yourself. By improving these areas of life simultaneously, you'll get more done with less stress. Gain greater clarity of purpose, accomplish more at work, and feel more connected to the people and causes that matter most to you. Leadership can-and indeed must-be learned. But first you've got to choose to lead. If you're going to make a difference, thinking of yourself as a leader will make it more likely that your legacy-not your fantasy, but the real impact of your life, today and in the long run-is the one you really want.